Dodge Neon and Plymouth Neon cars are enjoyable cars just as the come from Mopar. If you want more power, better handling and more all around performance from your Neon, we can help. Welcome to our Dodge and Plymouth Neon parts page. We are happy to assist our Plymouth and Dodge Neon customers with a wide range of Neon High Performance parts. More and more people are finding out what a fun and easy car to modify the Neon is. The Neon engine has been available in SOHC and DOHC versions, as well as naturally aspirated and turbocharged. In addition to the base Neon, we have parts for the SRT-4, ACR and Neon R/T. More new parts are becoming available for the Neon all the time. If you do not see what you want, please contact us and we will do our best to help you get the parts you want. In addition to the pistons listed below, we also offer custom Dodge Neon Pistons and Plymouth Neon custom forged pistons for special applications, big nitrous systems, or high boost supercharged and turbo charged applications, as well as higher compression naturally aspirated pistons. 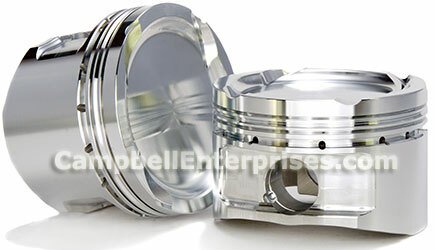 For more info on custom pistons please contact us with your needs and we will be happy to help. for use with Rod length of 5.472 in. piston pin size is .827 in. stock standard bore size is 87.50mm / 3.445 in. Compression Height 1.400 inches This is the distance from the centerline of the wrist pin bore to the top flat surface of the piston. + FREE SHIPPING!Free shipping in the USA for this item when you spend $499.00 or more!International shipping for this item is only $69.95! Sealed Power offers an excellent high quality, high performance, hypereutectic piston set, with DurOshield friction reducing material included on the skirts. The skirt coating reduces friction and wear, for longer life and more power. These are available for both the SOHC and the DOHC engines. The stock bore size is 3.4449" (87.5mm). Wrist pins are included with the pistons. The ring grooves are 1.20mm, 1.20mm and 3.00mm. The compression height, ch, for both sets is 1.225". The piston pin diameter is .8271", which is the same as stock. These pistons are for use with stock rods only! These Sealed Power piston sets include the wrist pins. H852CP std. bore 2.0L SOHC 1995-2004 Flat Top E901K std. The below listed pistons are for the DOHC engine, or they can be used in a SOHC engine when you want more compression than the standard SOHC pistons provide. H853CP std bore 2.0L DOHC 1995-1999 Dome Top w/ 4 valve reliefs E901K std. 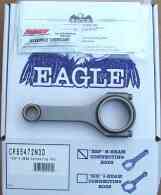 The KB pistons listed above can be used with a stock connecting rod, or the Neon Eagle rods listed below. Now a ultra high performance connecting rod is available for the Neon engines, at a reasonable price. These rods are forged from 4340 grade steel and are of the H beam design for high strength at a reasonable weight. There are several different sets available, depending on which engine you have and what rod length you want. Dodge Neon SOHC & DOHC, 3/8" ARP 2000 bolts, These come equipped with ARP 2000 series 3/8" rod bolts. They are the stock length of 5.472" and weigh 535 grams. They are for the stock crank pin size of 1.889" with a piston pin diameter of .826". The big end of the rod is 1.032" wide. Sold as a set of 4 rods. Dodge Neon SOHC & DOHC, long rod (+.136"), Same as above but with a longer center to center rod length of 5.608"
Dodge Neon SRT-4, PT Cruiser 2.4L "EDZ" This set also comes equipped with ARP 2000 series 5/16" rod bolts. They are stock length of 5.945" long and weigh 575 grams. They are for the stock crank pin size of 1.889" with a piston pin diameter of .826". The big end of the rod is 1.032" wide. Sold as a set of 4. Clevite 77 Tri-metal High Performance Neon Main and Rod bearings. These bearings can also be used as an upgrade in stock type rebuilds. *note the above 2028P series main bearings can be used in 1995 engines but may require that the main bearing caps be re-notched to match the position of the locating lug in the lower main bearing half. The new notch should be .106" to .111" wide and located .327" from the existing notch in the cap. This should be done using proper equipment and accepted practices. Rear tension struts feature a high durometer bushing material designed for heavy duty and competition use. The revised design results in improved toe stability, reduced bump steer, which virtually eliminated rear wheel hop under heavy braking. Provides more positive suspension control for improved driver feedback and dynamic stability. Stop body flex and improve handling. When the body is more rigid, the suspension is better able to control the vehicle and suspension tuning gives more improvements since the body is not flexing making suspension tuning even harder. Available in steel and titanium for front and rear. These heavy duty performance springs are designed for sporty handling combined with a comfortable ride. They provide a 25mm from the stock ride height. The Mopar Performance Blow Off Valve Conversion Kit maximizes the function of your vehicle's turbo system by venting excess, hot compressed air into the atmosphere, thereby reducing your intake air temperature. This kit adds a vent to the shock blow off valve and creates a unique turbo sound for your PT Turbo. Engineered exclusively for Neon, this camshaft was developed for power while maintaining reliability and idle quality. Use with valve springs P5249846.